The garden has a lot growing in it right now. The garden has really started to pick up recently. 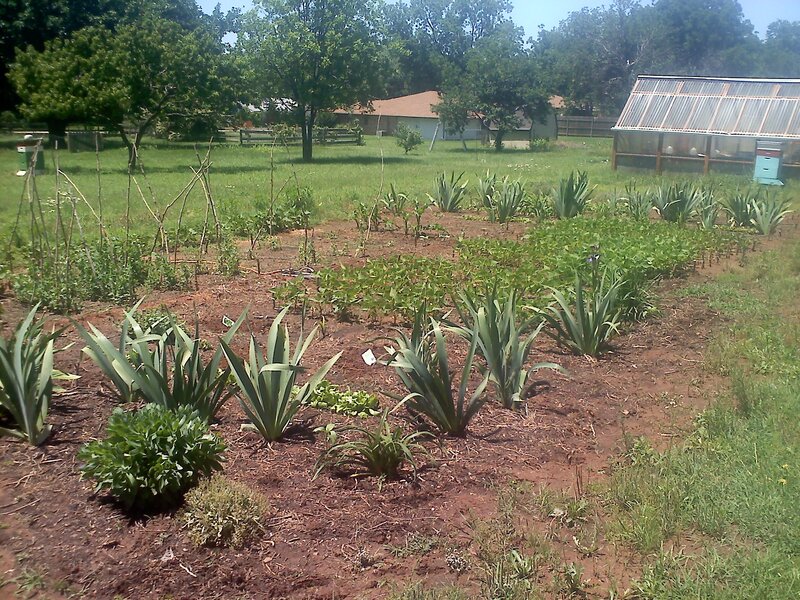 All the plants are starting to fill out nicely and in some areas are so dense that weeding is no longer needed. This is especially true under the radishes and the pinto beans. I’ve made better use of the garden space this year than I did last, but I still think I could easily squeeze in double what I have now if I were to plant more densely and start succession planting. This is quite evident where the peas were. I’ve harvested all the peas I will eat and am saving the remainder as seed. However, if I had planted beans in the rows by the peas about two weeks ago I would have small pinto bean plants already up. The main reason that didn’t happen is that was about the same time I caught something that the remnants of are still plaguing me. Also, while the lettuce I planted by the perennial flowers is doing quite nicely, there is still ground that could have been planted. 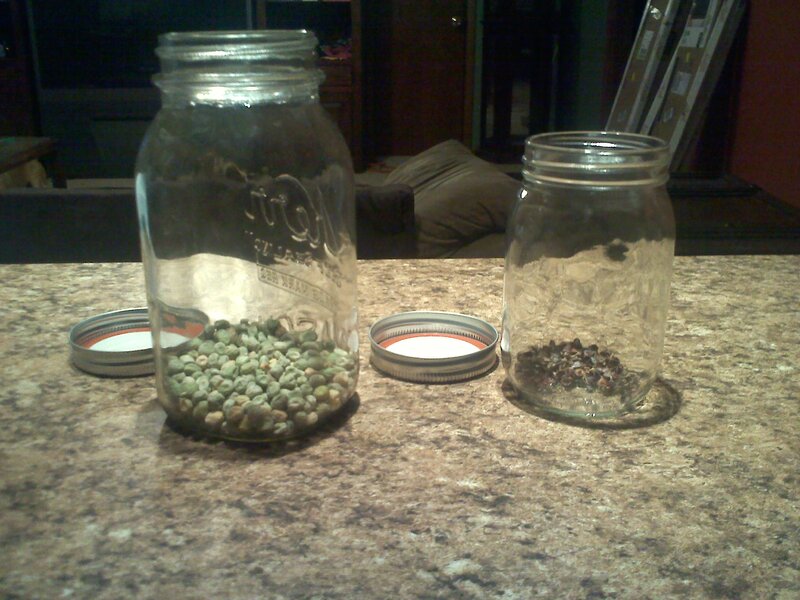 Peas and buckwheat seeds. Both were very easy to save. Just let them dry out on the plant and for the peas, to shell the pods. One of the things I want to do with my garden is to become mostly self-sufficient with seed. This obviously requires that I become familiar with saving seeds from all my plants. Last year, I saved seed from the pinto beans, the onion, some mint and a pumpkin. This year, I have added buckwheat and peas to the list and I am planning on adding radish, sunflower, lettuce and okra to the list. I’m still waiting on the sunflowers to bloom and the lettuce to bolt. In the mean time, I’ll be battling the caterpillars that started appearing on the sunflowers a couple of days ago. My main plan of attack is to knock them off the leaves into a gallon-sized freezer bag and freeze them to death and also preserve them for David to use in his aquaponics system. Since my tomato plants never made it in the ground and David’s are doing amazing, I might be able to get a tomato or two in exchange. 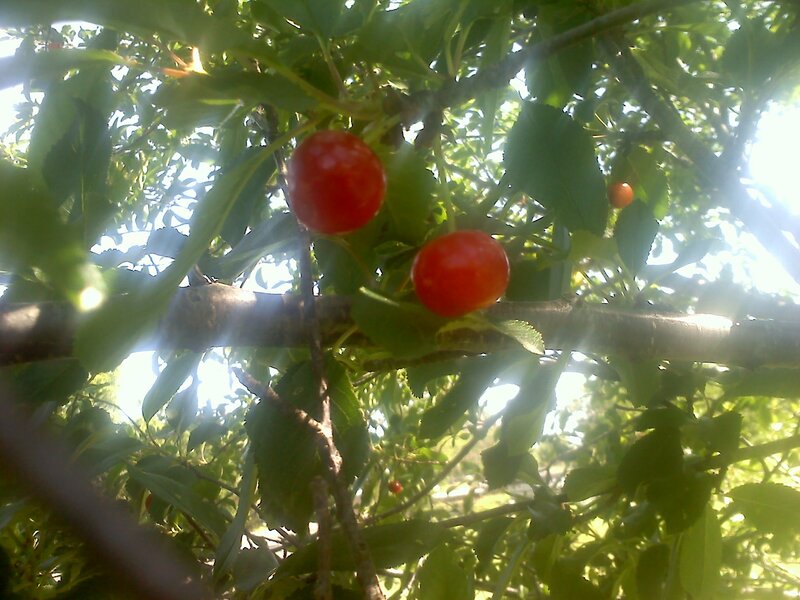 The cherries are ready to harvest. It is finally time to harvest the cherries. The cherries started to change color early this week and most of them were ready to be picked by the middle of the week, but the storms that moved through Oklahoma this last week has kept me from doing anything until Saturday. This year has been so different compared to last year. Just about everything seems to be taking a month longer. 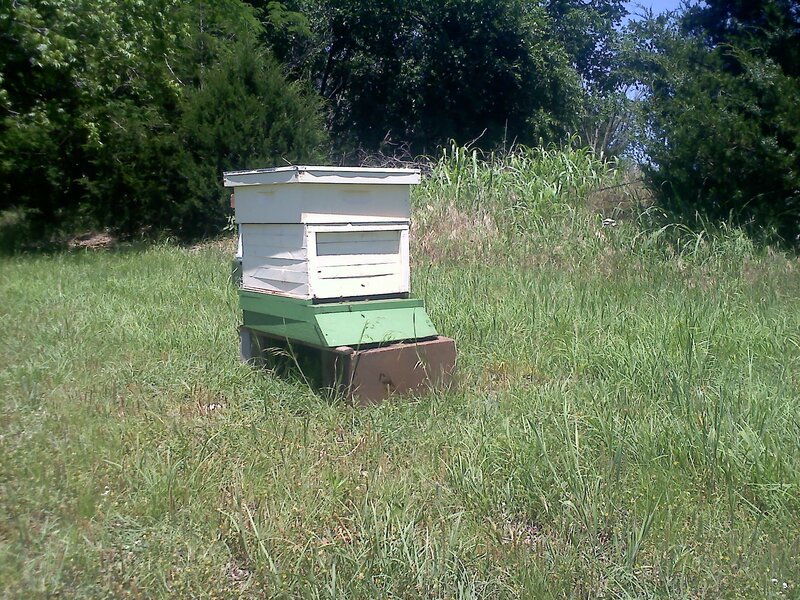 Once more, I have three hives on my property. About two weeks ago, I found a swarm in my back yard, but I was not able to catch it. However, I now have three hives on my property again. I ordered a queen to replace the queen in one hive to get less aggressive genetics, but before I was able to, they swarmed and I was unable to find the old queen. To prevent the queen from going to waste, we set up a third hive and put the new queen in there. We borrowed worker bees from another hive and a frame of brood to make sure the hive survives until the new queen can get to laying. 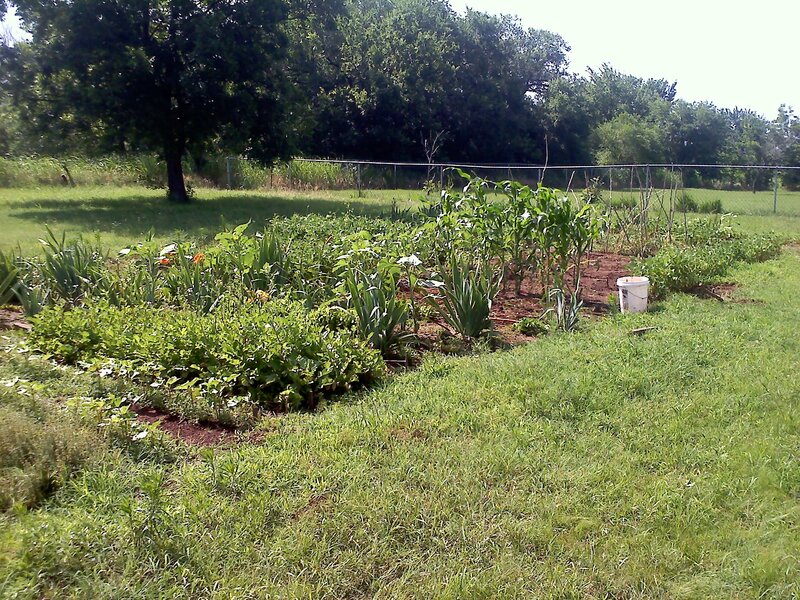 The garden has been making good progress over the past few weeks. The radishes in particular have been doing quite well and have managed to completely shade out the ground, which I like because it helps cut down on the weeds in that section of the garden. I would really like for that to be happening in more places in the garden, but so far I’ve only managed to do that here. The okra I planted has sprouted. My wife makes an excellent gumbo, which contains okra, so I’m looking forward to having some with okra I grew. The peas I planted this year are doing much better than my attempt last year. This year most of the plants that sprouted have flowered and have been setting pods. I accidentally pulled up one plant with pods while weeding today, so I ate the peas in the pods and shared them with my wife. It was the first time she has ever had peas straight out of the pod she rather liked them. Given that she normally avoids peas, this is saying a lot. There is nothing quite like peas straight out of the pod. If you have never had a chance to have them, grow some peas next year or find somebody who is growing them this year. You won’t regret the taste. The garden is looking very green, but I can probably pack even more plants in here. I finally have caught up with weeding the garden from when I when on my business trip early in May. Now I just have to maintain the bed, which is a lot easier. I don’t enjoy having to play catch up, but at least the wet weather has made the process considerably easier. I picked up some new seeds today and planted them in the garden: green beans to fill in the places in the rows of peas where the seeds didn’t sprout and basil, oregano, and parsley. These join the chives, thyme and mint I already have growing in the garden. I will eventually have a wide variety of herbs in the garden. The first Iris to bloom in my garden. 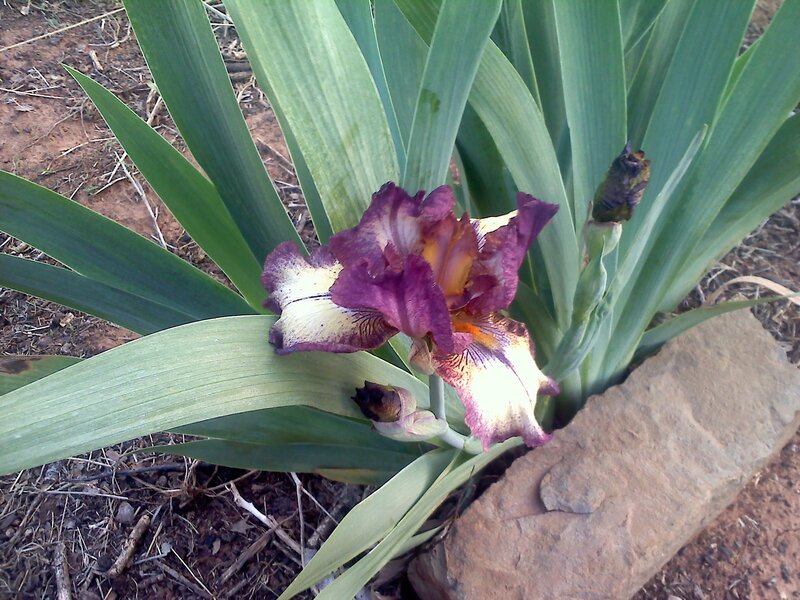 I went out to work weed the garden a couple of days ago to find that some of the Irises that I received from my Grandparents in Utah are starting to bloom. I planted these about mid-summer last year and they grew through-out the year. Now, some of the larger plants are starting to bloom. The whole thing is rather exciting, because I have no idea what colors I am going to get. 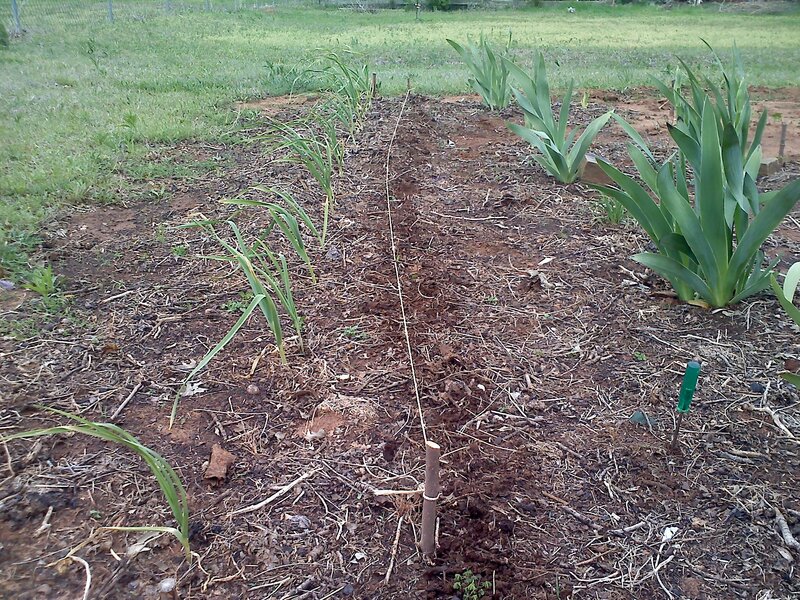 A line planted with radishes right next to the surviving 16 garlic plants. I still have quite a bit of space in the garden, so today I spent some time filling things in. I planted several lines of radishes and lettuce. The lettuce mainly went right next to the flowers where I don’t have to worry about pulling up a root crop disturbing the flowers. The radishes went into places where digging them up is not going to be an issue. 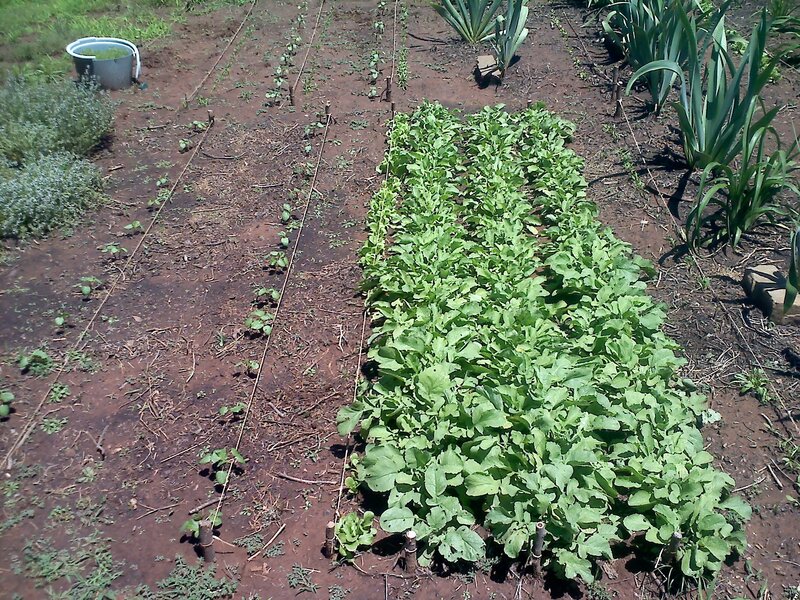 I’m trying to fill up the garden as best I can so that I can get a good harvest and also so that I can crowd out weeds. I would be very happy if the weeds had no space to grow. One of the peaches that survived the late frost that killed the blossoms. A few of the peaches survived a late cold snap are now starting to get large enough to actually determine how much was lost. I estimate that I will be getting about 20 to 40 times fewer fruit from the peach tree this year. It remains to be seen if the fruit decide to grow larger this year to compensate. I plan to skip thinning the tree of fruit like I did last year in an attempt to get larger fruit. The weather this year has been very difficult. We have had several late cold snaps that keep killing early plantings and flower blossoms. I haven’t planted a lot of crops out of fear they will end up getting killed. The tomatoes and the peppers are still in the greenhouse. The cold has also ended up stunting the growth of plants along with germination rates. About the only things that seem invulnerable to the cold are the perennials, the garlic and the peas. One of several lines of pea sprouts. Things are finally starting to pick up in the garden. 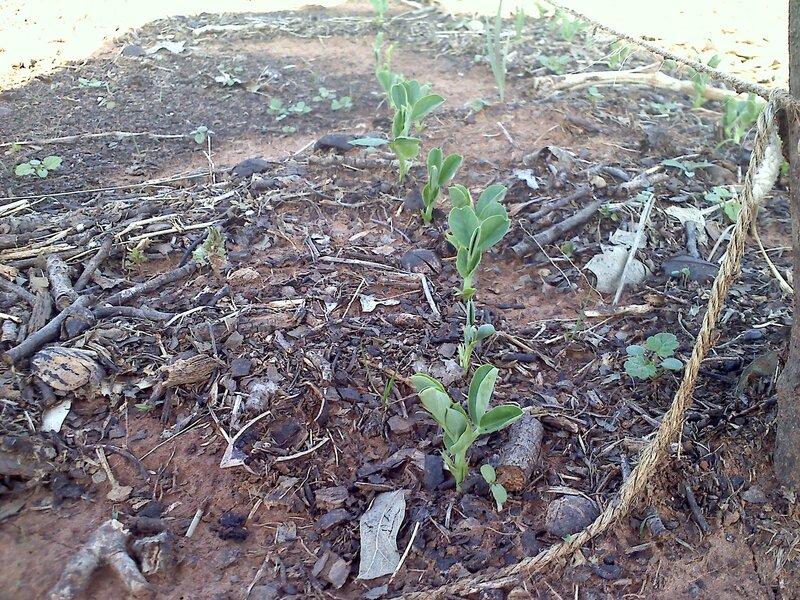 Nearly all of the peas I have planted have sprouted, and those that haven’t sprouted, I don’t really expect to see. The seed I was starting with was a couple of years old, so it doesn’t surprise me that some would not sprout. 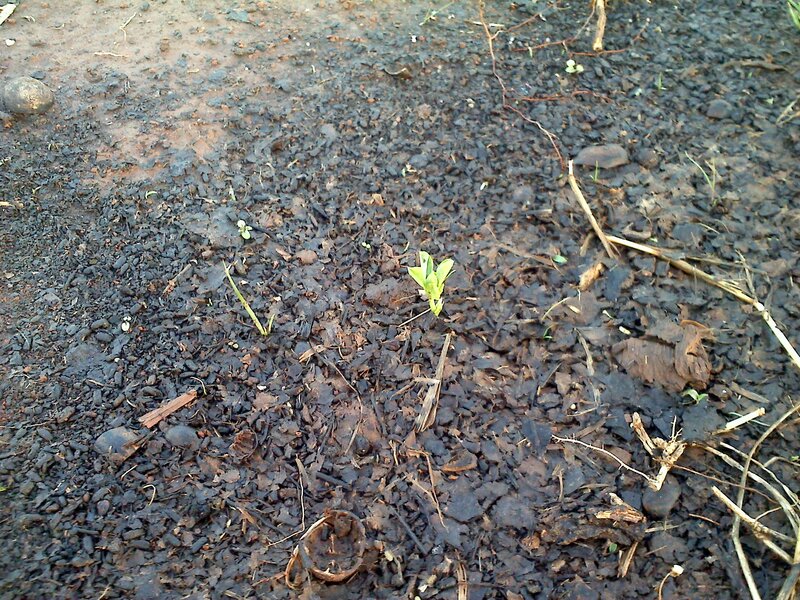 In addition to the peas, the beans are also starting to sprout. I still have several lines of beans to plant, but it looks like I’m getting good germination rates so far. About half of the seed in the ground I saved from last year, so I’m pleased with the results so far. I also have a few corn plants sprouted, but I have barely planted any corn so far. I intend to plant a lot more along the back yard’s fence line. This will be new garden space, so I am unsure how it will turn out. Probably fine, but there is always the chance of some wrench getting thrown in things. A honey bee on a cherry blossom. When I took this picture, the whole tree was buzzing with insects. The last chance of frost is quickly approaching. 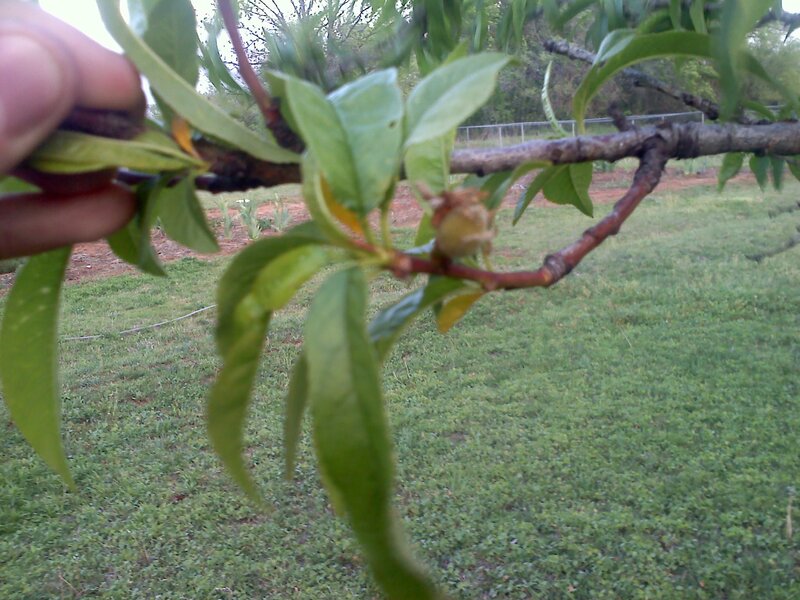 Already, one late frost hit the peach tree pretty hard and almost all of the blossoms died before starting to set fruit. Compared to last year, only about one in ten or twenty flowers is setting fruit. I hope the tree will compensate by making larger fruit, but even if it doesn’t, I’ll be happy with whatever fruit I do get. I still have several jars of canned peaches in the pantry to use. 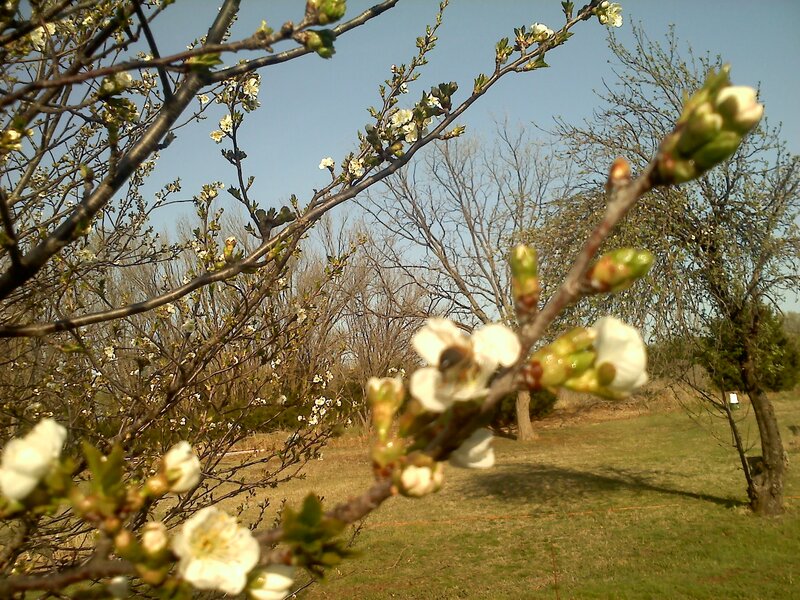 The cherry trees and the apple tree missed that freeze and are in the process of blooming, and hopefully the soft freeze forecasted for next week does not affect fruit set. At least this year, I know which tree is which. Last year, I mistakenly though the cherry tree was actually an apple. One of the first five peas that have sprouted. About a week and a half ago, I started direct planting peas and beans in the garden. So far, the results have been rather mixed. I have had five pea plants sprout and several of the beans also sprouted. However, the beans don’t seem to be surviving the cold night temperatures, so it is just as well that the majority of the beans to sprout yet. 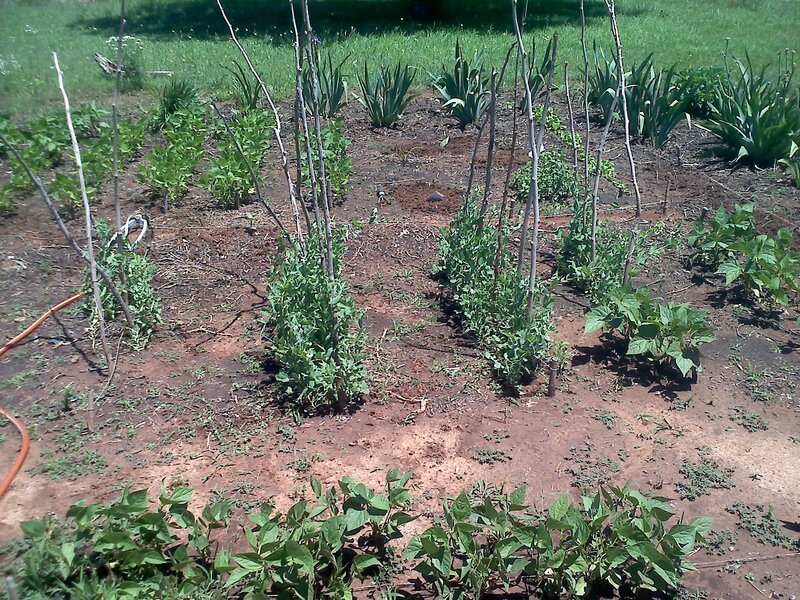 I have plans to plant the beans close enough that they basically form a blanket over the garden bed. The grape vine is starting to put on leaves. The grape vines are just starting to put leaves on. 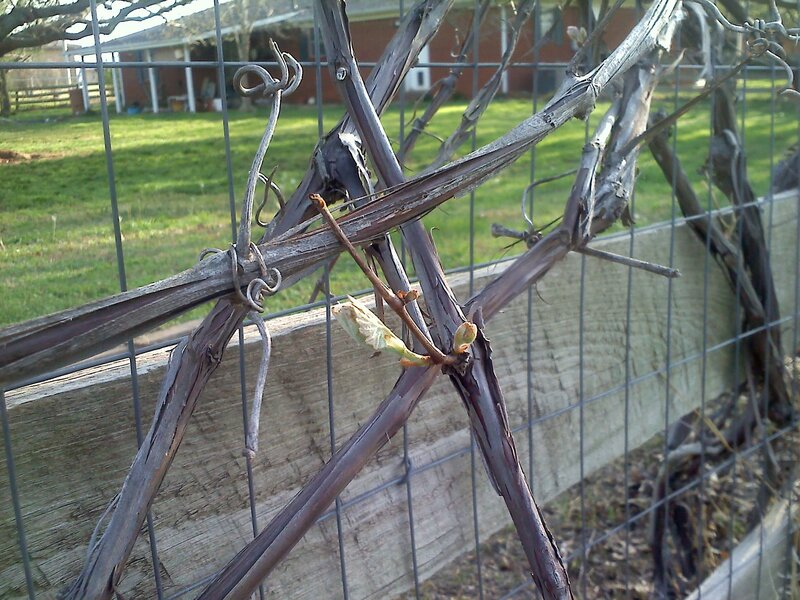 Last year, the grape vines had this happen almost a month earlier. In general, this growing season seems to be taking its time to get going. Not that I mind too much. I just am anxious to start seeing the results of my work. Last year, was not able to do very much with the grapes I harvested, and almost all of them went into the freezer. Because they are seeded grapes, they are not really useful for eating straight, so grape juice and wine are really the only uses for them and only the grape juice is really an option for me because I refuse to drink alcohol of any form. The only way I could get juice out was to cook the grapes and then strain them thru cloth. The resulting juice had oxidized and was not very good. 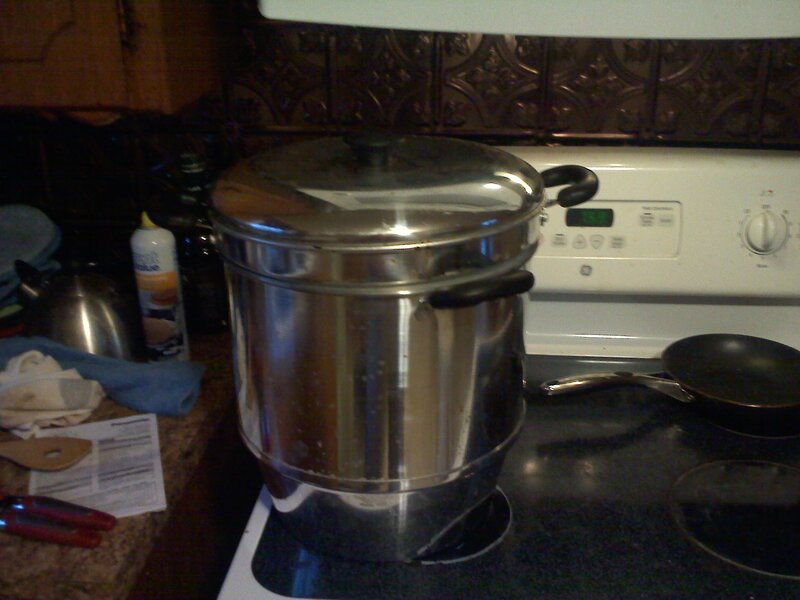 The steam juicer I used to make fruit juice. This is the same style of juicer that my wife’s grandmother used. About a week ago, I got a steam juicer in and was able to easily turn the grapes into very good tasting grape juice, along with the peach peals and apple peelings and cores. The juices will probably need to be mixed to get a good final product, particularly with the peach as it is quite tart, but overall, they taste quite good. The grapes in particular were quite good because the juicer keeps the grapes from oxidizing and giving the juice an off taste. 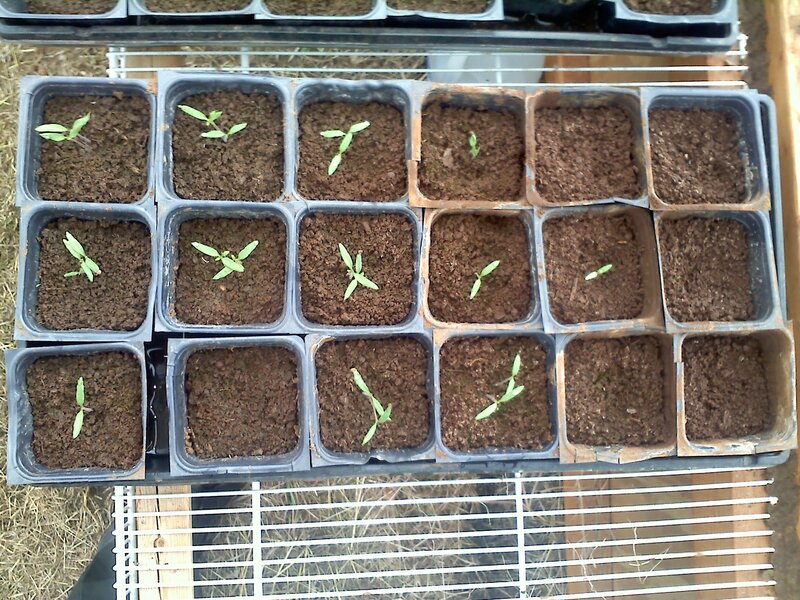 First up, here are the tomato sprouts. There are currently a total of 21 plants growing. I planted two seeds to a pot in an attempt to make sure that I got at least one tomato plant per pot. In a week or two, I will be thinning out the plants so that only the strongest plant remains in each pot. Also coming soon is hardening off the plants for outdoor planting. I intend to do this after I’ve thinned things out and it warms up a bit more outside. I’m willing to take a few chances with early planting, but I want the veggies to have a chance of surviving. I doubt that they could survive outside of the greenhouse right now. 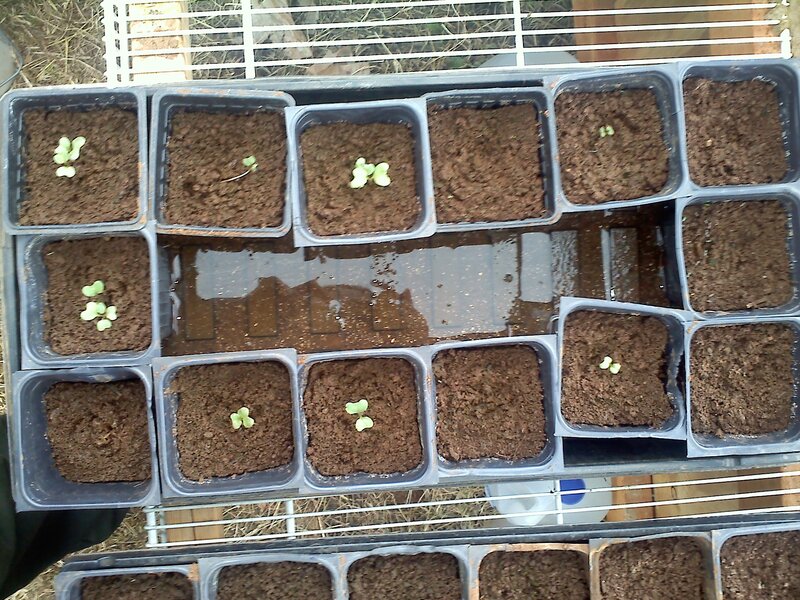 Cabbage sprouts are doing well. Next up are the cabbages. These were planted after the tomatoes were, so I am not surprised that not as many have sprouted. I’ve never grown plants from seed before so I’m learning what plants look like at an early stage. For a while, I was not sure which plants in the pots were the cabbages and which were very large weeds. A quick check on the internet resolved that issue and now only the cabbage sprouts and weeds that are still too small for me to grab remain in the pots. I seem to be having a problem where the pots closest to the wall are not sprouting. I suspect it is because the soil temperature is not a warm as those further inside the greenhouse and cool off quicker at night. Here be giant zucchini sprouts. 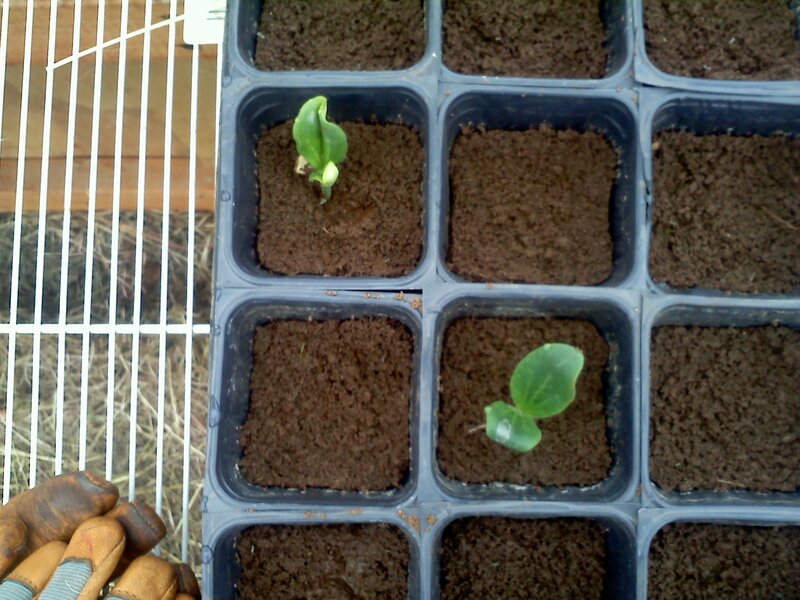 Now, the largest sprouts I have are the zucchini. These things a monsters compared to the other sprouts I have. So far, only two plants have sprouted. Not much more to say about these. I suspect that for several of the varieties that I am starting from seed, I am going to need to do a least a second batch of seeds, if not third and fourth batches. Part of this will be because not all seeds sprout, but the rest will likely be because of my skill, or the lack thereof. 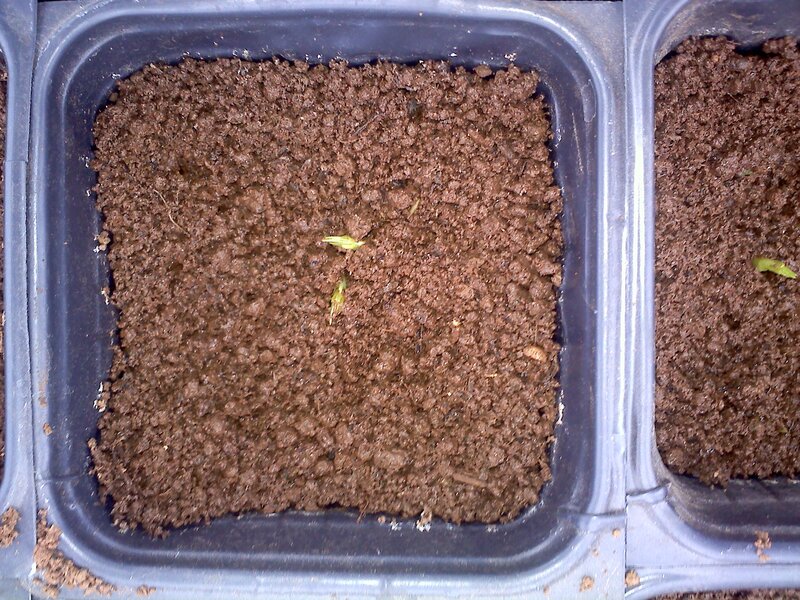 Last, but not least, the Alaskan peas I started this last week are sprouting. Nice to see another plant sprouting. Unfortunately, not all of the plants I have started have sprouted. I planted seeds for bell pepper within a few days of when I started the tomatoes, but I haven’t had a single bell pepper sprout. Or if I have, the sprout resembled the weeds I am getting closely enough that I accidentally removed it. Also missing are the yellow onions. However, the seeds I am trying for those were left over from last year’s planting by my home’s previous owner, so the seeds themselves are a bit suspect.